NORTH ROBINSON — Senior Kari Teglovic, daughter of Ryan and Lori Teglovic, is the November Student of the Month for November, 2017. She is a member of the National Honor Society and is the society’s treasurer. She also is treasurer for the Student Council and a four-year Academic Letter recipient. Kari has been on the basketball team, and runs cross country and track. She has earned all-county awards for cross country, and was named Second Team All-Conference in track. Kari has also received the John Spreng Teammate Award. She attends Grace Brethren Church in Ashland, where she works in the nursery. Kari plans to attend OSU-Mansfield where she will work towards a degree in early childhood education. She hopes to become a kindergarten teacher. The Student of the Month for March 2018 is Brody Martin, son of Todd and Heather Martin. He is a member of the Student Council and Leo Club. He is president of FCCLA. His service activities include helping with the FCCLA toy drive for Nationwide Children’s Hospital and cooking meals for families at Ronald McDonald House. Brody attends Bucyrus Nazarene Church. As a member of the basketball team, Brody has received varsity boys basketball N10 Honorable Mention twice. He has also received honorable mention for boys’ varsity basketball, District 6, Division 4. Courtesy photo Kari Teglovic and Brody Martin are recent Athlete of the Month honorees at Colonel Crawford High School. 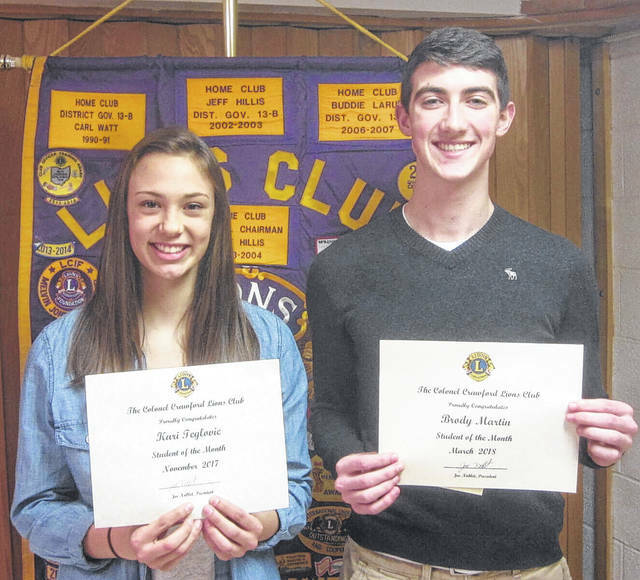 https://www.galioninquirer.com/wp-content/uploads/sites/38/2018/04/web1_send-to-media-Kari-and-Brody.jpgCourtesy photo Kari Teglovic and Brody Martin are recent Athlete of the Month honorees at Colonel Crawford High School.